A brief synopsis – Michael, Karen, Jim and others are applying for a new corporate job, and Michael is certain he has it. So certain is he, he names Dwight as his successor. Before he leaves for the interview, Jan comes back wanting to get together. Michael gather’s his support group (the women of the office) to muster up support. This plan is derailed by Jan’s revelation of her new assets. Pam, embracing the fact that she opened herself, does not shy away from the awkwardness that she has presented upon Karen. Even before Michael leaves, Dwight rampages through his new role as manager. Last year Creed asked me how to set up a blog. Wanting to protect the world from being exposed to Creed’s brain I opened up a Word document on his computer and put an address at the top. I’ve read some of it. Even for the intranet it’s… pretty shocking. The next best line – Dwight: Soil. Right. We have, in front of you here, seven different types of Pennsylvania top soil. Now, what would you say… is the most important element in the production of above ground leafy growth? Probably phosphorus, right? [Angela smiles, shakes her head “no”] Wrong! It’s nitrogen! Absorb this information. Good! Now, let us discuss precipitation. Stanley! When rainfall occurs, does it usually fall in a liquid, solid, or gaseous… state? 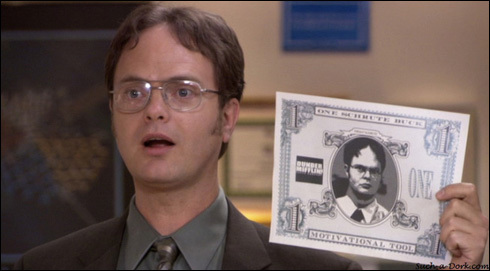 Dwight: We— Don’t you wanna earn Schrute Bucks? The best moment – Pam’s eyes when Jim comes back. The best storyline – Pam takes the reins on this episode and she shines. Would Michael have been reprimanded? – I think that David Wallace does a great job of selling Michael at what he is good at while recoiling from his unquestionably bad behavior.